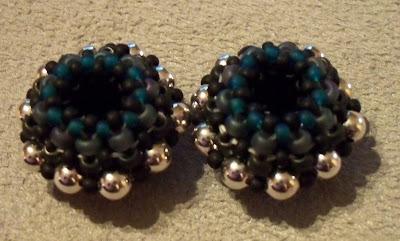 Tonight I started work on a project for a challenge, a beading challenge, organised by the Bead Mavens. It's called the Maven Meld, and the idea is to make a piece of jewellery based on two or more of the tutorials written by the Mavens (a group of top class beaders, who design the most beautiful beaded jewellery). So, I've been giving this challenge a lot of thought... like, several weeks thought - which is quite unusually for me; normally I just start beading and see where the beads take me. Basing some jewellery on two other people's tutorials is much more difficult than it first seemed! Normally I never stick to patterns, and add a little twist of my own, but actually getting two patterns to meld seamlessly was really tough. I've decided to base my design on the Trellis Necklace by Nancy Dale, and the Satellite Bead by Heather Collin. It's going to be like a Pandora-style piece, with three satellite beads on a trellis rope, all based on my favourite shades of green, and grey with silver thrown in for good measure. I've made two of the satellite beads, the third is going to have different shaped silver beads, to make it stand out as the centre bead. I'm not sure what the plan for the trellis rope is, but it is going to involve the teal, the matt black, and its going to be accented with the light grey AB beads.